An old man sits quietly among the cacti on a cold desert night, warming himself by a small campfire. His peaceful little scene is disturbed by when he senses the presence of another: the mythical chupacabras. The beast has designs on the old man’s goat. Before it can pounce, a ninja appears from the darkness to challenge the beast. As the battle unfolds, the old man testifies to the legend of Ninjito, the Mexican Ninja! One thing that many genre properties lack is a sense of the absurd. This is ironic seeing as how so many of them are based on outlandish ideas that beg to be taken seriously. This is especially true of films that mix different mythologies from different cultures. Both The Warrior’s Way and Cowboys and Aliens did so horribly. Nevertheless, this trend has yet to subside. That would explain why anyone would have the balls to attempt something like Ninjito: Mexican Ninja. 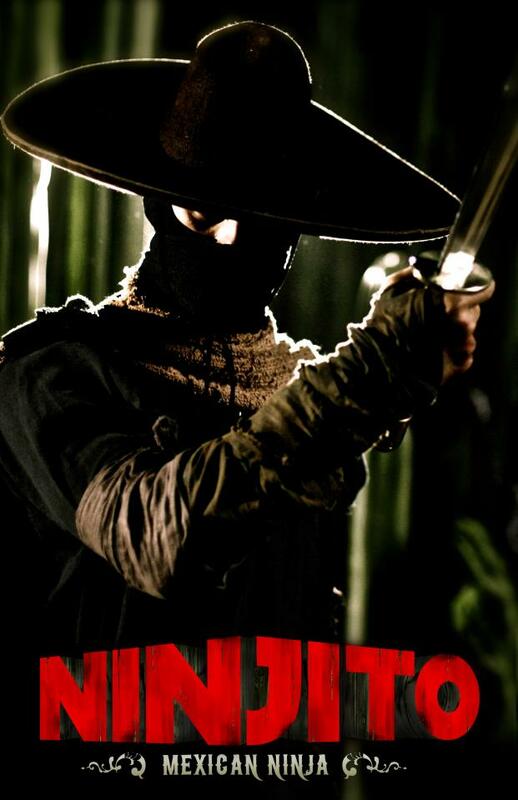 Ninjito: Mexican Ninja is a proof of concept short for a planned feature film. If the concept in question sounds silly, that’s because it is. Ninjito makes no attempt to pull its punches in that regard. While its very premise inspires laughter, its production values surely do not. The lighting and framing provide a nice mythical ambience, as does the costuming. The production design combines the sensibilities of manga and anime with that of live-action productions based on manga and anime, namely the ones from Japan. There’s an obviousness to the setting that feels more surreal than fake. This isn’t reality, but a mythic daydream based on reality. Ninjito begins with a Mexican sage sitting in front of campfire, issuing a warning to the mythical chupcabras. It’s played for laughs, but the actor’s racially ambiguous appearance is a visual representation of the film’s basic concept. Ninjito blends the mythologies of Japan and Mexico. The old sage dresses and talks in in a stereotypically Mexican manner, but looks vaguely Asian. In fact, he’s reminiscent of the drunken monks often found in classic chopsockies. He’s two archetypes rolled into one. The costume and creature design also combine a number of familiar mythologies. Ninjito looks like a cross between The Man with No Name and one of the ninja from Lone Wolf and Cub: Baby Cart at the River Styx. The chupacabras looks like a crawler from The Descent, and operates in a similar manner. It drags off the poor goat and devours it like the T-Rex in Jurassic Park. During the fight scene, it looks like a stubby, muscular Na’vi. Ninjito cribs from a number of different sources, and with good reason. All of the aforementioned films featured memorable imagery. Ninjito: Mexican Ninja is executed in a very tongue in cheek manner that successfully maintains a sense of wonder. Still, I wonder how this idea could be stretched out to a running time of 90 minutes or more. Perhaps they could have the chupacabra being dispatched by some evil baron in order to drive poor townspeople off of their land. It could be kind of like Zorro with a martial arts bend. After seeing this, I wouldn’t put anything past Josh Turnbow and his associates.